The NISAITEPCO meeting was largely a review of plant status, which has not changed in some time. 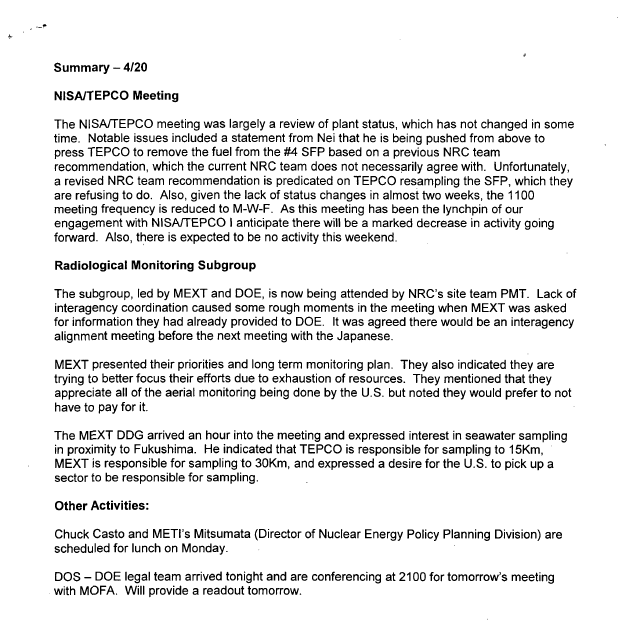 Notable issues included a statement from Nei that he is being pushed from above to press TEPCO to remove the fuel from the #4 SFP based on a previous NRC team recommendation, which the current NRC team does not necessarily agree with. Unfortunately, a revised NRC team recommendation is predicated on TEPCO resampling the SFP, which they are refusing to do. Also, given the lack of status changes in almost two weeks, the 1100 meeting frequency is reduced to M-W-F. As this meeting has been the lynchpin of our engagement with NISAITEPCO I anticipate there will be a marked decrease in activity going forward. Also, there is expected to be no activity this weekend. The subgroup, led by MEXT and DOE, is now being attended by NRC’s site team PMT. Lack of interagency coordination caused some rough moments in the meeting when MEXT was asked for information they had already provided to DOE. It was agreed there would be an interagency alignment meeting before the next meeting with the Japanese. MEXT presented their priorities and long term monitoring plan. They also indicated they are trying to better focus their efforts due to exhaustion of resources. They mentioned that they appreciate all of the aerial monitoring being done by the U.S. but noted they would prefer to not have to pay for it. The MEXT DDG arrived an hour into the meeting and expressed interest in seawater sampling in proximity to Fukushima. He indicated that TEPCO is responsible for sampling to 15Km, MEXT is responsible for sampling to 30Km, and expressed a desire for the U.S. to pick up a sector to be responsible for sampling. Chuck Casto and METI’s Mitsumata (Director of Nuclear Energy Policy Planning Division) are scheduled for lunch on Monday. DOS – DOE legal team arrived tonight and are conferencing at 2100 for tomorrow’s meeting with MOFA. Will provide a readout tomorrow.